I know it’s not cool to like Eurovision, but I don’t care. I love it! I watch it every year and love it for the cheese-fest that it is. 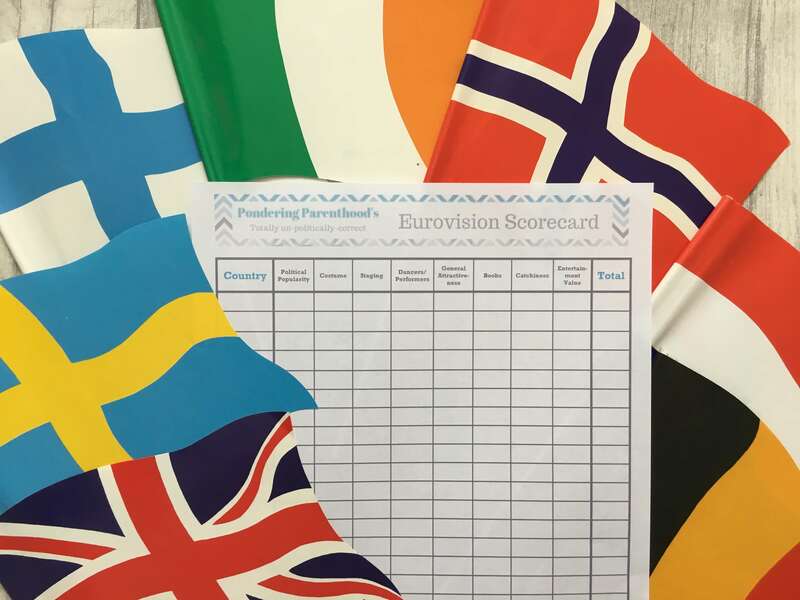 I’ve never had a full-on Eurovision party (although I’m sure it will happen one day!) but for the past few years I’ve had a friend round to watch and we’ve made our own scorecards to make the whole process a bit more exciting. Then at the end we compare to see how our favourites have fared alongside the official scores. They rarely match up, mainly because the categories we use to score each act probably aren’t the same as the ones the judging panels use. Anyway, without further ado, I bring you a FREE (unofficial) Eurovision printable. 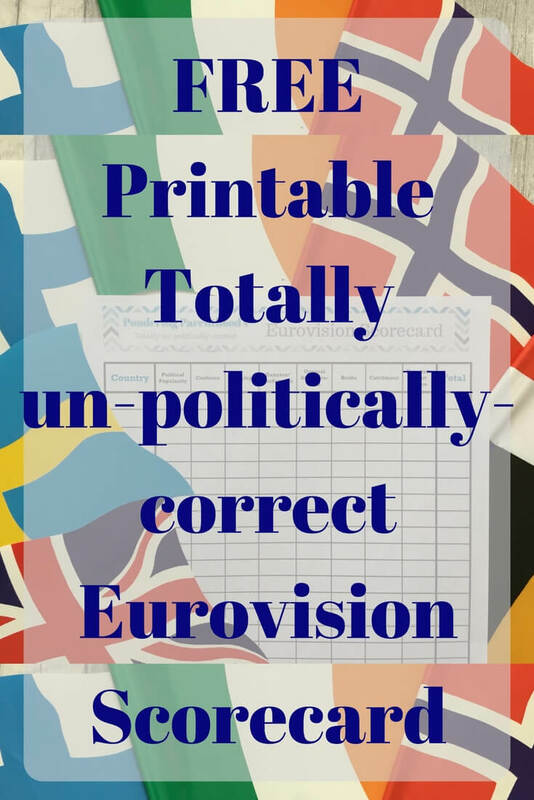 Ladies and gentleman, Pondering Parenthood’s Totally un-politically-correct Eurovision Scorecard! There are eight categories, and we score each of them out of ten. We then add the scores across each category, to give a total. Terry Wogan (may he rest in peace) banged on about it enough, so we all know that Eurovision is all about politics and that most countries vote for their friends and neighbours. Therefore, I thought it appropriate to have this category first, so that we can mull over how much we like each country while the baffling introductory video is playing. Because let’s be honest, they’re a bit boring, aren’t they? Man in a hamster wheel, anyone? If you can still hum it three songs later, it will score high in this category. I’ve had this stuck in my head since yesterday when my husband started singing it after I mentioned I was making the scorecards for this weekend. This can mean whatever you want it to. I kind of felt we needed a category to acknowledge if someone can actually sing but doesn’t necessarily score highly across the other categories. Or you just like the song. I’ll leave you with one of my personal Eurovision favourites from recent history and wish you an enjoyable evening in front of the television! "I only went for a blood test…"
This is brilliant. I went to a eurovision girls night a few years back and it was loads of fun! This would have been fab to use! It’s perfect to make it a bit more fun if you’re just sitting in and watching at home, too! Enjoy! OMG you gotta love some Lordi!!! Great idea on these score cards! Sadly playing on my own with an 11 month old wouldnt be as fun! boo!! hehe!